It is no secret that Singaporeans enjoy pampering themselves. From vacations to the Maldives or Europe, fine dining at Marina Bay Celebrity restaurants, to shopping at Ion for Louis Vuitton’s latest bags, Singapore’s affluent know how to spend on the finer things in life. This being one of the many reasons luxury brands thrive in Singapore. The luxury market however is increasingly becoming hyper competitive. With consumer needs becoming more and more complex, luxury products are competing with other categories such as travel. Also new consumer journeys, younger segments, and the entire digital landscape evolving at a rapid pace means luxury brands need to be proactive to ensure their new design and products are exactly what the affluent are looking for. 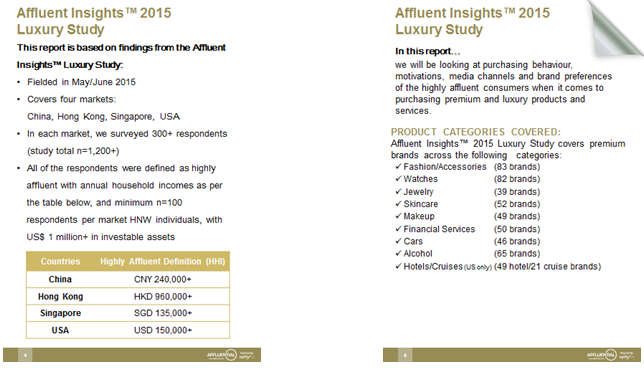 In this brief report, Agility Research takes you through the pulse of Singapore’s Affluent; looking into how confident they are about the future, what motivates them to buy luxury goods, which brands are popular now, and which ones are likely going to do well in the next year. Findings come from a study conducted in May-June 2015 where we spoke to 300 affluent consumers in Singapore, at least 100 of whom can be classified as high net-worth. Affluent Singaporeans will be spending more over the next year. They are confident in the stability and growth potential of their finances leading to more disposable income, particularly amongst males (see fig.1). 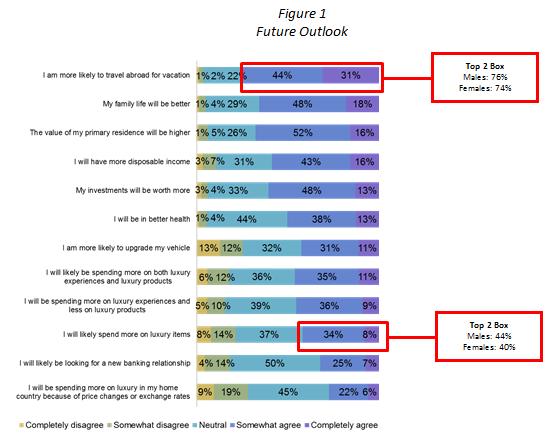 This, however, does not deter females as their propensity to spend for travel and luxury goods is similar to males. 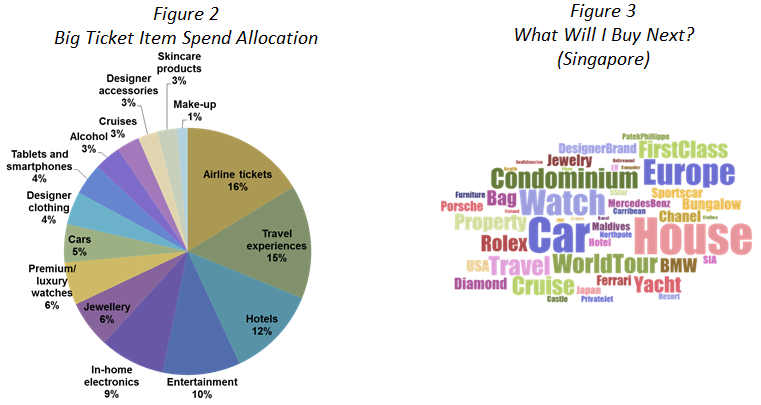 Big ticket spending in the past year was allocated mostly to travel-related expenses, similar across females and males (see fig. 2). Singaporeans are likely going to be spending in the same manner over the next 12 months, with majority planning to buy a car, house, or a trip to Europe. 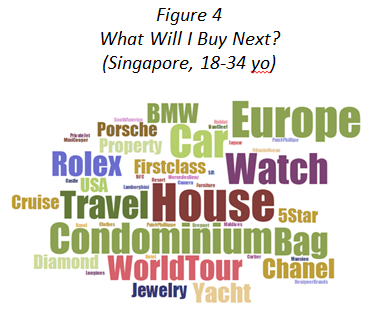 In contrast, the 18-34 year olds, also known as the AAAs (Ambitious, Aspirational, Affluent), are more likely going to contribute to luxury good consumption in the next year, particularly handbags and watches (see Fig. 4). Interesting to note is the fact that while Singaporeans have been, and are going to be spending more on travel, much like the affluent in Hong Kong (see fig. 5), their neighbours in China will be spending more on luxury goods, most likely on timepieces (see fig. 6). This indicates that the future of luxury growth, especially for the timepiece category, will be the mainland Chinese market (not necessarily in China). For Singaporeans buying luxury, it is primarily a means to enjoy goods of impeccable quality, design, and craftsmanship (see fig. 7). 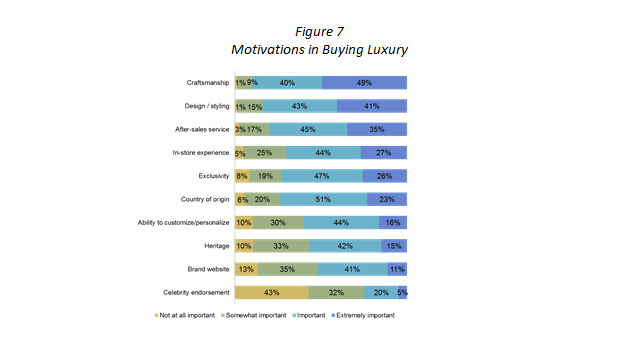 Coupled with the fact that only less than half of affluent Singaporeans claim that using a brand recognizable to others is important to them, it is clear that status is not the most important benefit of owning luxury for this particular market (unlike the Chinese, of which 7 out of 10 need a brand that others can recognize). To Singaporeans, exclusivity is more important than recognition. To attract this market, luxury brands need to differentiate and stand out with unique materials and with innovative and avant-garde designs, rather than through loud logos and celebrity driven communications. With Singaporeans confident about the future, many are claiming that at least one expensive watch purchase will be in the books for the next 12 months. With 33% and 27% already owning a Rolex and TAG Heuer (both are popular amongst males and females, and amongst 35 and up for Rolex), respectively, many are looking to stick with the classic popular brands, but expect other super-premium brands to step up this year. Interestingly, Rolex sales will be driven by the 18-34 year old (AAA) market at 31% and 15% claimed purchase for males and females, respectively. The older demographic of 45-49 year old males, 41% whom already own Rolexes, are less likely to purchase a luxury watch in the next 12 months than their younger counterparts. In contrast, older females (35-44 years) are as likely as the AAAs to purchase a new watch, particularly brands like Rolex, Omega, Chanel, and Cartier. Amongst high net-worth Singaporeans (those with investable assets of at least USD 1M), brand choice is similar, with Rolex, and Omega likely to top sales in this niche demographic. Knowing how this market gains knowledge on timepieces and how their purchase decisions are influenced, can help luxury brands prioritize their communications spend. Agility measured the popularity of a wide variety of media, both as sources of awareness or research and as decision influencers. Research shows the importance of driving luxury watch brands by maintaining a strong presence across traditional media, online and in-store (see fig. 8 & 9). Note how watch brands become salient due to their presence in airport duty free shops/ads, shopping mall boutiques/department stores. Moreover, magazines have long been a source of information for luxury brands in general. Advertising, and features in influential publications, perhaps like Esquire, and World of Watches, are still critical to the brand building process despite the increasingly significant role the digital world has in the lives of Singaporeans. Our reports are available across a wide selection of markets, with options for deep dives amongst the high net-worth, and AAA (18-34yo) markets. Visit us at http://affluential.com/premium-reports/ for more on what is available. Agility Research & Strategy is Asia’s fastest growing research company, ranked globally as a Top 10 research firm in the Luxury and Premium brand research space. As Agency of the Year nominee and with over 30 years combined experience in understanding the Affluent consumer, we are truly Fluent on the Affluent™. We partner with leading brands to provide actionable insights through a suite of data, research and intelligence solutions to boost their market share. AFFLUENTIAL ™, the World’s first Global Consumer Intelligence portal, powered by Agility is a comprehensive platform for brands looking for intelligence on Affluent consumers across categories in more than 20 key economies including the United States, Europe and Asia Pacific.